If it walks like a Jeep and talks like a Jeep, is it a Jeep? That's what we're asking ourselves today as we stare into the retro-fantastic sheet metal of this Mahindra Roxor, a diesel utility vehicle for those who want to want to wander off the beaten path. 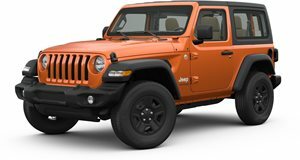 With a price of just under $15,500, it's hard to see why you wouldn't buy two of these instead of a Wrangler—that is until you realize it has a top speed of 45 mph and it can't be driven it on public roads. That's right. This, legally, is a side-by-side. Mahindra is making a big play for North America. While it has sold tractors on American soil for years, the Indian company has had a difficult time breaking into the U.S. automotive market. It initially planned to import a diesel pickup and sell it though a distributor here, but all Mahindra got instead was a lengthy legal battle and nothing to show for it. Now, Mahindra (via ) is beginning to dip its toes in the sales pool with the Roxor, which is powered by a 2.5-liter turbodiesel four-cylinder engine developing 62 horsepower and 144 lb-ft of torque. Those figures probably won't send your heart aflutter, but—like we said—this Jeep can't drive 55. Sending power to all four of the Roxor's 16-inch wheels wrapped in 235/70 rubber is a five-speed manual transmission, clutch pedal included, matched up with a two-speed transfer case for when the going gets tough. It's far from big with a 96-inch wheelbase and overall length of 144 inches, but it's larger than most side-by-sides on the market and has 9 inches of ground clearance. The Roxor is heavier, too, weighing in at a Miata-busting 3,045 pounds, but like a worker ant, the Indian Jeep can tow more than its own weight: 3,490 pounds, to be exact, at speeds of up to 15 mph. Bringing the Roxor to a stop are 9-inch front disc and 11-inch rear drum brakes. The base model is priced at $15,499 with the stats above and without doors. Limited Edition (LE) models get a soft-top, an 8,000-pound Warn winch, a KC HiLites 40-inch light bar, gnarly BF Goodrich KO2 off-road tires, and mirrors. Not special mirrors. Just normal mirrors. Like you would take for granted on literally any road car these days—even the Mitsubishi Mirage. Regardless of trim, the Roxor seats only two people. The Mahindra Roxor will be built right here in the U S of A and is available now at any of Mahindra's 70 nationwide dealers. You can configure your own .